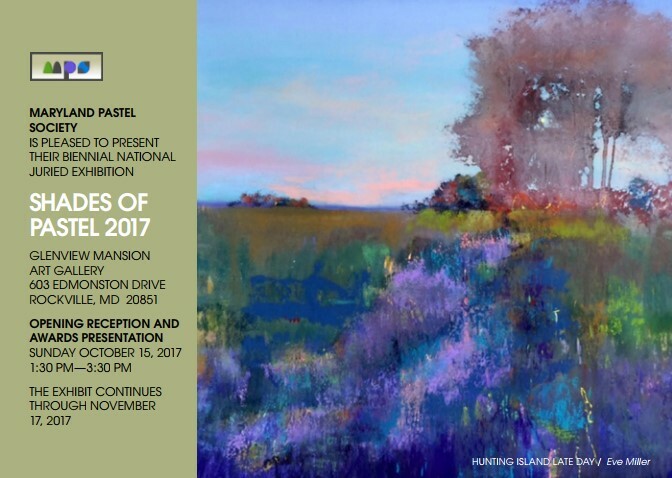 The Maryland Pastel Society Shades of Pastel National Juried Exhibition is held every two years in the mid-Atlantic region. SOP2017 was held at the historic Glenview Mansion in Rockville, Maryland. Entrants hailed from 19 states and the District of Columbia. Our Juror was Desmond O'Hagan. Click on the SOP2017 Postcard below to view the award-winning artwork. Click here to view the winners of SOP2015. SOP2015 was held at the historic The Hill Center in Washington, DC. Our Juror was Doug Dawson. SOP2013 - The Delaplaine Visual Arts Education Center, Frederick, Maryland. Jimmy Wright, Juror. SOP2011 - Workhouse Art Center, Lorton, Virginia. Liz Hayward-Sullivan, Juror. SOP2009 - The Strathmore Mansion, North Bethesda, Maryland. Richard McKinley, Juror. Learn about different types of memberships. With a minimum of $25 Donation, you will be listed with the 2019 Shades of Pastel Exhibition Sponsors. Our exhibit is held every two years, assuring that Sponsors will be featured until Fall 2021. The Maryland Pastel Society is a 501(c)(3) non-profit organization, making your donations tax deductible.